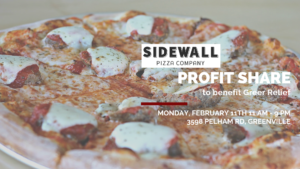 Sidewall Pizza is generously donating a percentage of the day’s sales to benefit Greer Relief! Stop by throughout the day to enjoy pizza and support Greer Relief. Volunteers are also needed. To find out more click here.